Save this recipe! 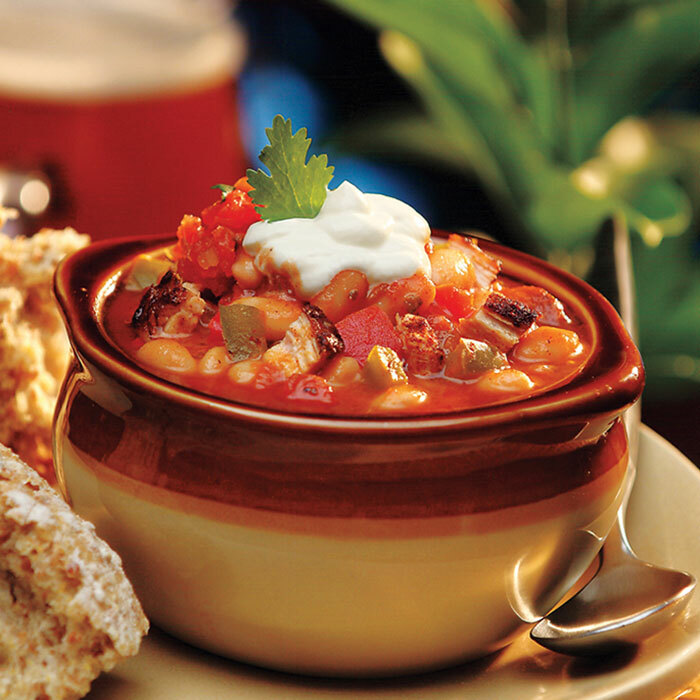 When the days are cold and gloomy, you will love something warm and filling like this wonderful chicken chili. In large saucepot, cook bacon over medium-high heat 4 to 5 minutes or until crisp, stirring frequently. Reduce heat to medium. Add bell peppers, and onion, and cook 3 to 4 minutes, stirring frequently. Stir in chili powder, marjoram, oregano, cumin, and garlic powder, and cook 1 minute. Stir in flour, salt, cayenne pepper, and black pepper. Meanwhile, sprinkle both sides of chicken with jerk seasoning. Heat oil in large nonstick skillet over medium-high heat. Add chicken and cook 3 to 5 minutes or until deep brown in color, turning once. Reduce heat to medium, and cook chicken 5 to 6 minutes longer or until internal temperature reaches 165°, turning occasionally. Cut chicken into ½ inch pieces.